While in our time, we haven't ventured deep enough into space to need other systems for the exact determination of positions within our incredibly large galaxy than the equatorial and galactic coordinate systems, in the world of Star Trek, in which the interstellar navigation is the basis of trade, politics and the everyday life of billions of people, a further subdivision of space is used, beside the much two large division into "galaxies" and the much two small division into "planetary systems" - the subdivision into quadrants and sectors. These two terms, whose meaning was quite contradictious at the beginning, but has been exactly fixed in the meantime, have become a basic element of the space navigation shown in Star Trek through the years, since with the sector and quadrant system, a certain place can be quite precisely localized, without using a complicated coordinate system. sometimes a quadrant indeed corresponded to a quarter of the galaxy, but all too often it also denoted considerably smaller regions. In this connotation, the size of a quadrant rather corresponded to the size of a sector, like the designation "quadrant 904" in [TOS] The Squire of Gothos indicates. Up to the beginning of The Next Generation and also in the first movies the "quadrant" wasn't defined unambiguously and was used contradictorily. Finally in Star Trek VI, the current - and correct - quadrant system was introduced, according to which "the galaxy is subdivided into 4 quadrants, from which each forms a 90 degrees piece of cake, viewing the galaxy from the top or the bottom" (Star Trek Encyclopedia). An insider information on this movie even implies that the system was mainly introduced to justify Captain Sulu's claim that "he is in the Beta quadrant and currently the only Star Fleet ship in the quadrant." An interesting irregularity is the unusual designation system of the quadrants. They are arranged neither clockwise nor counter-clockwise. Instead, the lower left quadrant is called "Alpha", the lower right one "Beta", the upper left one "Gamma" and the upper right one "Delta". It is unknown whether this was originally a mistake that wasn't corrected afterwards to keep continuity or if it was dramatic intention to degrade the quadrant of the classic empires of the Romulans and Klingons to a "secondary quadrant" (after all, the Federation is supposed to be mainly located in the Alpha Quadrant!). Unfortunately, in the last years it has become obvious that the script authors more and more disregard the quadrant system, which is still valid according to all recent official publications. At the beginning, this problem mainly concerned awkward, but individual errors by the authors, who simply mixed up Alpha and Beta Quadrant ([VOY] Message in a Bottle) and therefore mistakenly indicated a counter-clockwise quadrant arrangement, but now, in ST:DS9 as well as in ST:VOY, the Beta Quadrant is completely ignored, which is fatal especially concerning the Klingons and the Borg, which originally had nothing to with the Alpha Quadrant. Even a subspace transmission (warp 9.9999 with amplification) covers this distance in more than three months. Consequently, only the fact that Earth, the Federation and most of the other empires are located at the frontier between Alpha and Beta quadrant makes it possible that we hear something about other quadrants at all, and it isn't surprising that the two remaining quadrants - Gamma and Delta - were not explored until the era of DS9 and Voyager started, and then only with "tricks" like wormholes and intergalactic displacement waves. In contrast to the quadrants, space sectors, that are mentioned in nearly every episode (remember sector 001 - the solar system), are an astronomically small division of the galaxy and therefore more useful for the exact determination of positions in Star Fleet's everyday life - what explains their often use (although, however, in the recent seasons of Voyager and DS9 the Alpha Quadrant was mentioned in every second episode). Because the dimensions of a sector are, in contrast to the quadrants, not important for the episodes and this subdivision was always used for space regions of small scale, it isn't astonishing that the official definition was not determined "first hand" in a episode or movie (not even as background information), but in an official documentation. According to the pretty general definition of the Star Trek Encyclopedia, a sector is a space region with a diameter of 20 ly, although some official maps further specify a sector in the three-dimensional space as a cubic volume. By using its diameter, we can exactly calculate the needed time for travelling through a sector at different warp factors, which shows that for warp civilizations, a sector is a quantity they can easily manage within days. However, at impulse speed, a sector is as insurmountable as a quadrant, since instead of days, now tens of thousands of years are necessary for the travel. At any rate, a sector is apparently not a natural, but a artificial, systematic subdivision of the galaxy into smaller space regions, what is also supported by the Encyclopedia, which suggests that "a typical sector in Federation space contains 6-10 planetary systems, although there are many more in the sectors near the Galactic core." Therefore, Sector 001 should not only contain the solar system, but also e.g. the Wolf and Alpha Centauri systems. Just as the quadrants, also the sectors have some irregularities in their designation, but that's acceptable in this case, because of the sector numbering system of the Federation, we only know the starting point (sector 001), but not the direction of the numbering, and the situation of the numbered sectors introduced in different episodes towards each other is unknown. However, it is very likely that in view of the centuries of space exploration and already different designation systems today, the system of the Federation is contradictious itself and the sectors are numbered more or less arbitrarily. It is also possible that the sector numbers, like the registry numbers, were assigned to newly discovered space regions at entirely different locations in space with increasing sequence, and the sector system accordingly has a chronological order. With the given numbers, however, we can nevertheless assume that at least larger space regions consist of systematically numbered sectors. For sectors near the Romulan Neutral Zone in the Beta Quadrant, which were crossed by 2150 for the first time, TOS used sector numbers with two digits, e.g. Sector 23, 30 and 31. The almost one century later surveyed sectors near the Klingon Empire, on the other hand, have 4-digit numbers, like Sector 2520. It is then very logical that sectors near the Cardassian Union and Talarian space, that were not discovered by the Federation until the beginning of the 24th century, carry 5-digit numbers, e.g. Sector 21503 and 21947. The position of sectors in the range of 100 till 1000 (e.g. sector 441) is unknown, however, they are probably located in the Southern Alpha Quadrant as well, but nearer to the center of the Federation. The Star Trek Encyclopedia suggests that "some sectors kept their old designations from earlier cartographing systems the same way as we use today both the older Messier and the newer NGC numbering system." In fact, some sectors apparently haven't a number at all (like the Igo Sector and the Bajoran Sector); they were named after the dominating planetary system or most important star in the sector. Beside the strictly scientific subdivision of the Galaxy, for the everyday life in the 24th century - as well as today - especially the political subdivision of the Milky Way is important. However, the appearance of a political map of the Milky Way considerably differs from a normal geographical map, because such a inconceivably vast region like our Galaxy can surely not be compared with the surface of a planet. Basically, in our Galaxy there is only a fistful of sufficiently large interstellar empires that take up more than one pixel in a map at all and can therefore be drawn in. Due to their low number and their distribution in the whole Milky Way, most of the area of a map of the Star Trek Galaxy remains blank - unexplored or neutral space, in which the local peoples inhabit only few planets, but not larger regions of hundreds of light years. 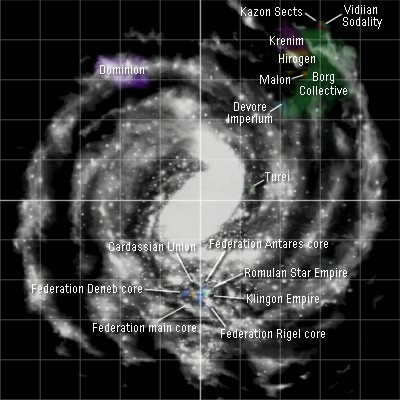 Already the mere space explored by humanity - about 5000 ly on both sides of the Alpha/Beta Quadrant border, at which Earth is located, there are six closely adjoined interstellar alliances and empires - Federation, Romulan Star Empire, Klingon Empire, Cardassian Union, Breen Confederacy, the Tholian Assembly and a dozen other important powers such as the Ferengi, Trill, Talarians, Tzenkethi and Gorn. 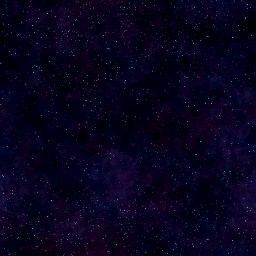 However, actually solely the United Federation of Planets with 150+ member planets, numerous Federation protectorates and hundreds of colonized planets, which are scattered over 8000 ly and distributed to several agglomeration areas ("cores"), is large enough to be visible on an overview map without exaggerated dimensions. Beside the Federation, the sole super power in the (known) lower part of the Milky Way, however, there are more comparably large or even larger powers in the upper half: the Dominion in the Gamma Quadrant, which takes up a whole part of the Sagittarius arm of the Milky Way, and the Borg Collective, which core region has a perhaps five times as large volume than the Federation has, but whose sphere of influence extends over the half Delta and Beta Quadrant. There are still other powers in the Galaxy, but which do not owe their large territories to their political status (like the Federation as a loose, not necessarily spatially joined interplanetary alliance) or their superiority to other species in numbers or technology (like the Borg or the Dominion), but to other factors, which effect the extension of their empires. For example, the Krenim belong(ed) to the dominating super powers in the Delta Quadrant with almost a thousand planetary systems solely due to alterations of the time line, which enlarged their empire and finally made it smaller again. On the other hand, the Hirogen dominate a larger area of space despite their slow ships because of the nomadic way of life which is typical for them - they restlessly travel around to hunt their prey. The Turei inhabit a larger part of the lower Delta Quadrant, because they have access to the sophisticated subspace corridor system of the Vaadwaur. In the end, most peoples have too little influence on other empires or a too less established territory to be called a super power, so that the number of interstellar important alliances is very limited. Finally, the exact political subdivision of the Galaxy remains unknown, because our knowledge is sketchy at best. Only some small parts of the Alpha, Beta and Delta quadrants are known, in which nonetheless the territories of more than a dozen powers are located. The Gamma Quadrant could be explored merely four years, until the Dominion - the sole power known in this quadrant - prevented this. Consequently, there is enough space in the Milky Way for hundreds of interstellar alliances and empires, which could be discovered already with the next deep space mission - the Cytherians, which apparently populate a huge part of the galactic center, are only one example. Borg (Delta and Beta) Federation (Alpha/Beta) Cardassian Union (Alpha, as of Dominion membership) Tholian Assembly (Beta)? Dominion (Gamma and Alpha) Krenim (Delta, one possible time line) Klingon Empire (Beta) Breen Confederacy (Alpha)? After this summarizing introduction in the general subdivision of the Milky Way and the political situation in the Galaxy, now the time has come to immerse in the Star Trek Galaxy and to examine the most important planetary alliances and empires, their location, structure, formation and development more elaborately, starting with the United Federation of Planets.